The Bulls pulled back up to .500 with their second win in a row, giving every appearance of coming out of their slump. But also give credit to Matt Buschmann for another superb outing (Game Score: 77). I wasn’t listening, nor have I read any follow-up, but pulling Jordan Norberto after just two batters does not look good. Here’s hoping that he’s OK. Meanwhile, a much-reduced player crew took the field and put together a three-run 5th inning that was enough to win the game. By much reduced, I mean really much reduced. In the last few days three infielders have gone on the disabled list: Hak-Ju Lee, Vince Belnome, and Alexi Casilla. Leonardo Reginatto was called back from Montgomery and Tim Beckham is on his way, but the next couple of days are going to be tricky. As far as I can tell, today the Bulls have one player on the bench, whomever isn’t catching. Catcher Mayo Acosta is probably traveling with the team and could probably be activated, though. Pitcher Enny Romero went to St. Petersburg, pitched three innings, and is coming back. Talk about a long walk from and to the bullpen! He did his job, but did walk in a run. To take his place, Bulls reliever Preston Guilmet was called up. He has 14 appearances in the majors, 4 in 2013 and 10 last year with Baltimore, so he’s been there before. Good luck! After two days of looking at Game Scores over time, what about individuals? 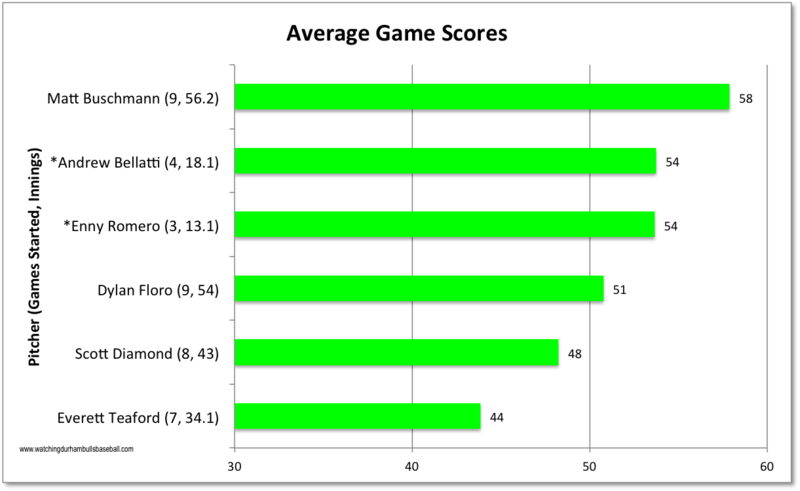 Here’s the average game scores this season for Durham Bulls starters. It’s a pretty close match to our view of them measured by other stats. Beginning to think this may be a pretty useful for evaluating starters. Note that here in AAA not all starting pitchers are destined to remain starting pitchers. And a not-so-good sign for the Bulls is to note that #2 and #3 are on the 40-man and are already going back and forth to the Rays.